Welcome to our new blog representing Wynn-Smith Landscape Architecture, Inc. Through this site, I, along with guest writers, will be writing about landscape architecture, various other forms of art, equestrian related issues affected by design and other topics that I find important to share. Reader comments and questions are very much encouraged. Sustainability has become quite the buzz word these days and that subject will certainly be discussed here thoroughly. It is important to remember that part of sustainable design includes addressing the social well-being of our clients and the community in which the project is located. This is why art is very important to my work as a landscape architect. I enjoy finding ways to express ideas through design as well as solving the issues of earth sciences. What an interesting profession this is because it requires us to understand both art and science and use them together on a daily basis. Coming from a family immersed in the equestrian world, at some point I realized that I had something special to offer the horse industry. While there are many good landscape architects, most do not understand the needs of horses or the people working on the farms/ranches. Additionally, most experienced horsemen understand very well what is dangerous on a farm, the importance of efficient layout and many other issues related to horses, but few can put all of those important aspects together in such a way that the design of the farm or ranch (depending on what part of the world one is talking about) is beautiful, efficient, safe and sustainable. This is exactly what we offer. We know the questions to ask our clients to generate discussions that solve problems long before completion of the design details and these are the issues that will be presented through this blog site. 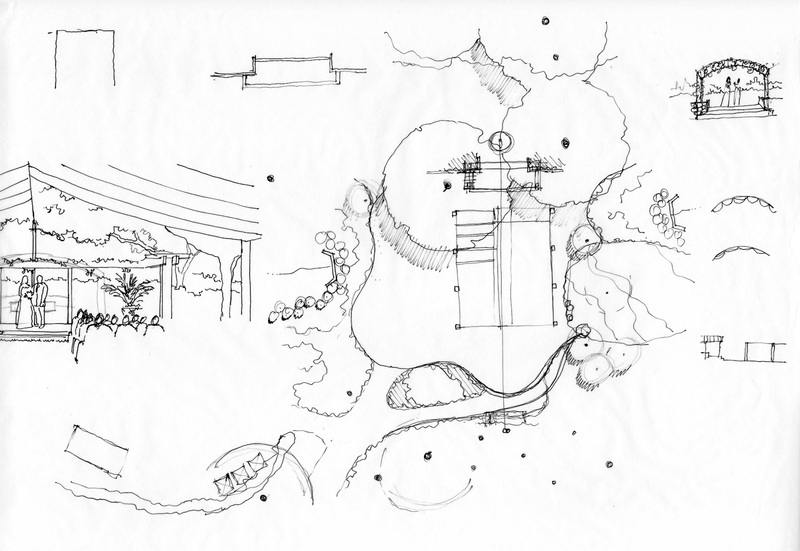 Sketches during design process for an outdoor wedding space. As I have progressed in my understanding of designing outdoor spaces, it is clearer and clearer that nearly all art forms, including landscape architecture, share many of the same principles. Due to this commonality between the arts, I am fascinated by what can be learned from music, painting, sculpture, photography, etc. and how they can influence our work. These subjects, and more, will be discussed in future blogs and my hope is that the articles serve as good food for thought.